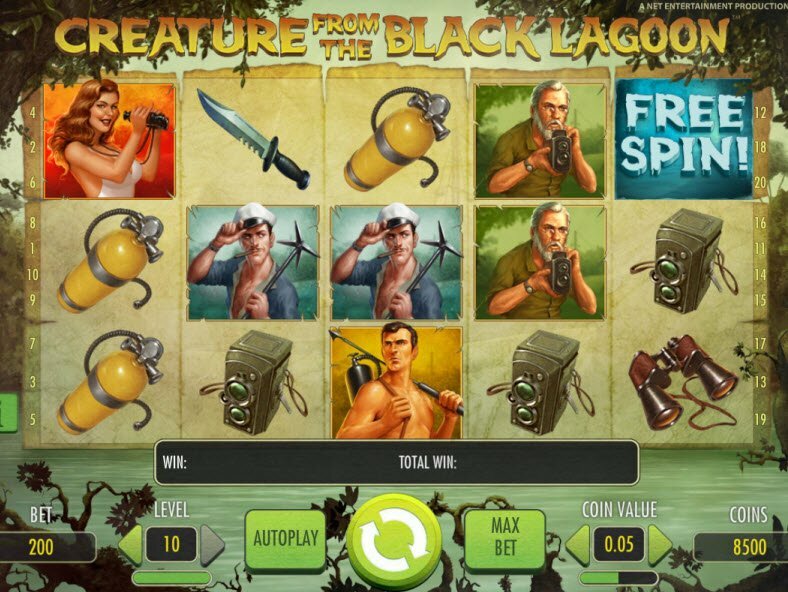 NetEnt software’s The Creature from the Black Lagoon Slot recreates the classic 1954 film from Universal Studioes about a half-fish, half-man monster. The Slot contains 20 paylines and comes loaded with bonuses including Wild substitutions, Spreading Wilds, Sticky Wilds, Free Spins, and a Re-spin feature. There’s so much to love about Net Entertainment’s Creature from the Black Lagoon Slot. First of all, I particularly adore the retro images and sound clips from the classic film. I love the red haired pin-up that graces the reels. Secondly, the slot takes on the horror film genre. The creepy creature from the lagoon would frighten the pants off of anyone, but that’s the fun of it! Not to mention, the graphics look high quality and the sound effects sound crystal clear. It’s no surprise considering NetEnt software developed the game. They always bring their A-game when it comes to graphic design and creative themes. Wild Symbols act as Sticky Wilds. After a winning combination, the Wild remains in its position for the next spin, increasing the chances of winning again. 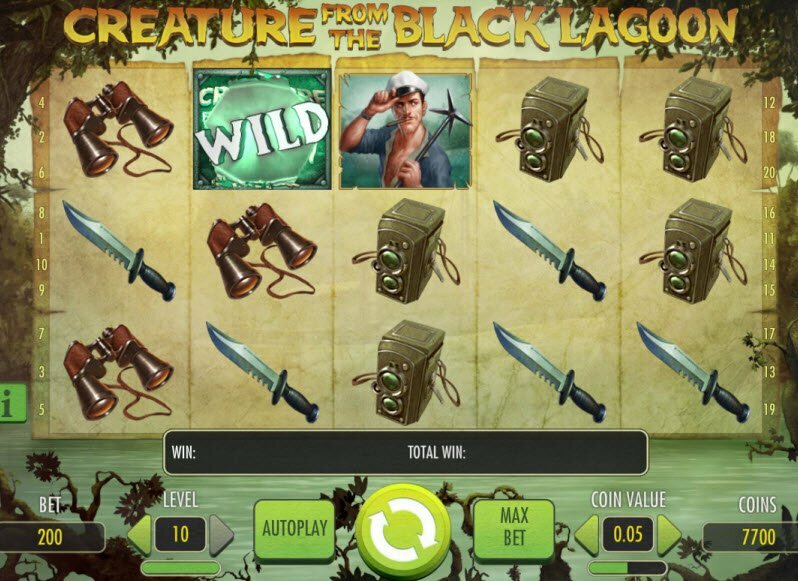 The Creature from the Black Lagoon comes fully loaded with bonuses such as Wild substitutions, Spreading Wilds, Sticky Wilds, Free Spins, and Re-spins. Wild Symbols appear randomly across the reels and substitute from all symbols except Free Spin Symbols. In addition, Wild Symbols act as Sticky Wilds. After a winning combination, the Wild remains in its position for the next spin, increasing the chances of winning again. 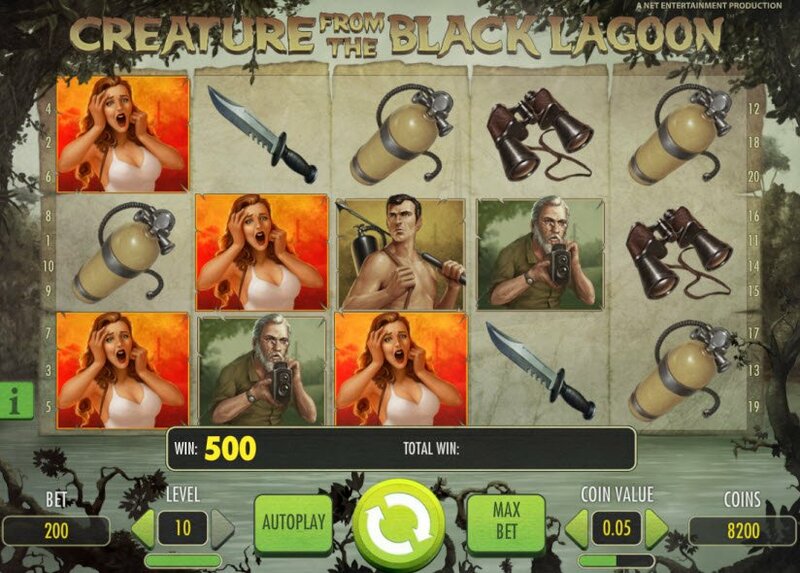 The Creature from the Black Lagoon Slot bonuses also include a Free Spin symbol that awards up to 20 Free Spins. Players can even win additional Free Spins or Spreading Wilds after the Free Spins activate. During the Free Spins, players get the chance to rescue the lady from the creature.